A pet dog photo frame with room for three photographs (and a few pawprints!) this frame is a real winner and a great gift for dog lovers. Well, family members get their photos in a frame so why not the family pet dog! One of our 'Gifts For The Home' range. 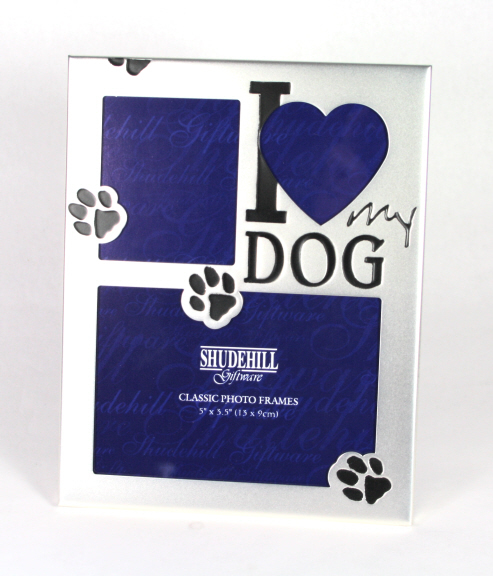 Outer frame size 7" x 5 1/2"
Photo area approx sizes a) 2" x 2 1/2" b) 4 1/2" x 3 " c) 2" x 2"
Cute 'I love my dog' photo frame for dog lovers.This small silver and black photgraph frame is just right for the most important member of the family! A wooden 3d cut-out freestanding sign on a black base with the words 'home is where the dog is' painted in white complete with pawprints! A paw print keyring with the words 'My dog's not spoiled, I'm just well trained' in black and white.